William Blakes Gedicht "Antwort der Erde" lieferte die Inspiration zur Sammlung meditativ-erdender Kompositionen. Deuters lichte Gitarren, R. Carlos Nakais wehmütige indianische Flöte, Popol Vuhs Synthesizer-Kultmusik zu Herzogs Film Aguirre, Hamels Mandala für präpariertes Klavier. Obertongesang von David Hykes, tibetische Klangschalen von Wolff/Hennings, türkische Weltmusik zum Tanzen von Tekbilek/Keane u.a. Das breite Spektrum von Celestial Harmonies in 15 repräsentativen Stücken. 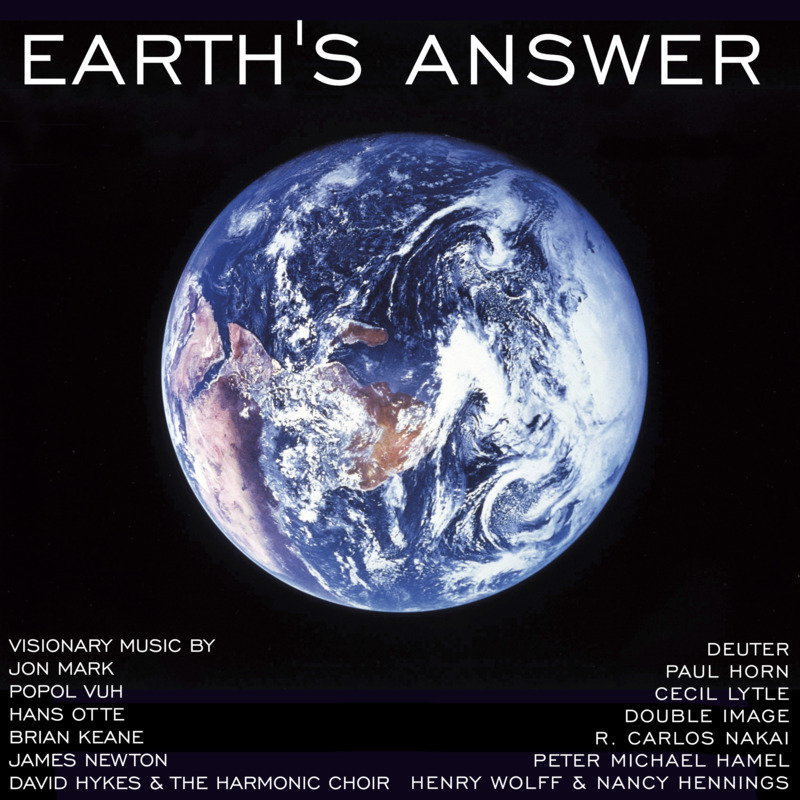 Earth's Answer represents the finest of contemporary instrumental music. The role of this recording is twofold. It offers a taste of the music from Celestial Harmonies releases, by some of its most celebrated artists. The recording also embodies a grander vision and broader purpose which takes it well beyond its value as an excellent sampler; Earth's Answer was created to rejoice in the spirit of the Earth and the unity of its inhabitants. Indeed, the various selections reflect influences from cultures around the world such as Chinese, Turkish, Tibetan, Indian, and Native American. Specifically, these include works from Paul Horn's China (11080), Brian Keane's soundtrack, Süleyman the Magnificent (13023), Henry Wolff's Tibetan Bells II (13005), Deuter's Land of Enchantment (11081), and Carlos Nakai's Sundance Season (13024). This release provides the opportunity to revel in the wisdom and spirit of the music of the world. Consummate musicianship, compositional craft and vision, and the willingness to express innovative musical ideas are common attributes of the artists on Earth's Answer. Some of the most renowned musicians in the contemporary instrumental music field are represented here. Included are legendary flutist Paul Horn, multi-instrumentalist Deuter, and keyboardist, composer, and scholar, Peter Michael Hamel. Other artists include Hans Otte, James Newton, Double Image, and the phenomenal David Hykes and the Harmonic Choir. All of these artists reveal a profound richness of emotion in their music. Their compositions and performances are born of personal convictions about the purpose and power of music, and of an intense commitment to their instrument and to their art. Earth's Answer, a collection of works from today's most profound artists, could be the response to the question, Where does the soul of the world exist? 1 Istanbul'dan Görüntüler by Brian Keane from Süleyman the Magnificent (13023) 4'01"
2 Silver Air II by Deuter from Land of Enchantment (11081) 1'41"
3 Chloe's Day by Jon Mark from The Standing Stones of Callanish (11082) 5'30"
4 Wind of Dawn by Deuter from Land of Enchantment (11081) 2'40"
5 Land of Enchantment by James Newton from Echo Canyon (13012) 5'43"
6 Ritual I by R. Carlos Nakai from Sundance Season (13024) 5'48"
7 Moon Dance by Paul Horn from China (11080) 2'41"
8 Ki by David Freidman and David Samuels from In Lands I Never Saw (13015) 5'58"
9 Mandala (Opening) by Peter Michael Hamel from Transition (12063) 7'30"
10 Enneagram by Cecil Lytle from Seekers of the Truth (14020) 4'32"
11 Part 12 by Hans Otte from The Book of Sounds (11069) 5'30"
12 Astral Plane by Henry Wolff from Tibetan Bells II (13005) 5'20"
13 Bell from Current Circulation (13010) 0'15"
14 Kyrie Fragments (Excerpt) by David Hykes from Harmonic Meetings (14013) 5'07"
15 Aguirre by Florian Fricke from In the Gardens of Pharao/Aguirre (13008) 6'15"